Cheap Trick Recreates Entire ‘Budokan’ Album Live in L.A. It was 35 years ago today, Cheap Trick taught all the other bands to play…or something like that. It was in 1978 that Rockford, Illinois’s finest made rock ‘n’ roll history with Cheap Trick at Budokan, arguably (or inarguably, in this writer’s not-so-humble opinion) the greatest live album of all time. The disc was initially intended to be a Japanese-only release, but once Yanks heard the import, they were understandably blown away by the ball-busting, heart-racing, riot-inciting Cheap Trick live experience. And thus, the album became an overnight phenomenon in the U.S. as well. And thus, the standard by which all other live albums must be measured was established. Since then, the band has weathered its unfair share of ups (Dream Police, One on One, a return to form on a 1997 self-titled release); downs (Busted, being strong-armed into recording the schlocky power-ballad “The Flame”); and way-downs (um, “Up the Creek”). But through it all, they’ve always maintained a kung-fu grip on their much-deserved title of Hardest Rockin’ Band in Showbiz. Even when they were slugging it out on the oldies/county fair circuit, they were clearly more than capable of recreating the greatness that once had an arena’s worth of hysterical Japanese fans shrieking their heads off. And on April 30, exactly 35 years after the band played the second of two Tokyo shows that made up Cheap Trick at Budokan, that’s exactly what these mighty rock titans did: They recreated their past greatness, with a glorious onstage celebration at Los Angeles’s El Rey Theater. (On April 28, the 35th anniversary of the first Budokan concert, the band played the John Varvatos boutique in New York, at the former location of defunct punk club CBGB.) As the legendary powerpoppers sequentially stormed through all 19 of Budokan‘s adrenalized anthems over 90 minutes, they whisked a deliriously happy L.A. club audience off to Tokyo on their own rocket-fueled Orient Express. True, the rather intimate (770-capacity) El Rey was a far cry from Tokyo’s cavernous Budokan venue, but as soon as the lights dimmed and the Red Hot Chili Peppers’ Chad Smith introduced his all-time favorite band as “Cheap f***ing Trick!!! !”…well, the club morphed into a 12,000-seat arena. There was a feeling of total glad-to-be-alive elation and giddy anticipation–the kind that can only be found at a rilly big RAWK show–and when the band bounded out onstage, the shattering screams that greeted them seemed to surpass the decibel levels of any maniacal coliseum crowd. The band still definitely looked the part. Frontgod Robin Zander was actually wearing one of his fabled snow-white suits, and although his famous flaxen tresses weren’t quite as abundant as they were nearly four decades ago, his positively supernatural lion’s roar of voice was in top form, and he still looked every inch the solid-gold rock idol. Ditto for gracefully graying bassist Tom Petersson, chugging away on his metal-flaked 12-string bass, who was all gussied up in a velvet smoking jacket. Even resident weirdo Rick Nielsen, fresh from his recent gigs with Dave Grohl’s allstar Sound City Players, looked like a sharp-dressed man. Original drummer Bun E. Carlos wasn’t there–but Rick’s son, Dax, sitting in behind the drum kit, was clad in frumpy Midwestern-accountant office attire that did Bun’s legacy proud. 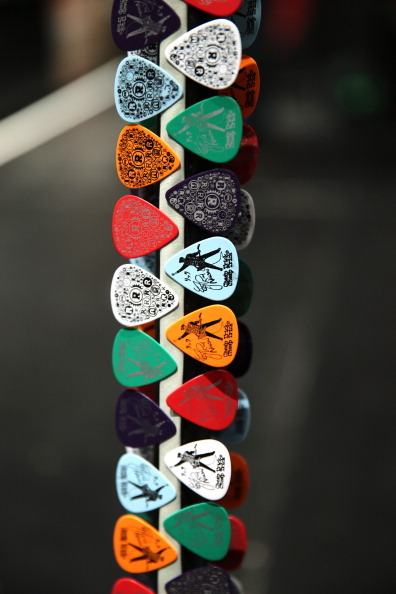 When not diving for picks and vinyl discs, the ecstatic fans, all earplug-to-earplug smiles, also indulged in that traditional Cheap Trick concert pastime, “Count The Guitars,” as Rick strapped on one six-stringed beauty after another. This culminated in, of course, the unveiling of the guitar to end all guitars…(drumroll, please)…his mammoth, quadruple-necked, black-and-white-checkered monstrosity. Best. Guitar. Ever. From the familiar chords of the above-mentioned “Hello There” to the Big Ben-inspired finale “Clock Strikes 10,” Cheap Trick’s classic cuts held up well and sounded bristling and current, much more so than the hoary old tunes by many of their ’70s peers. It was pure powerpop heaven tonight. And then…it was over. Cheap Trick left the building. “See you in another 35 years,” Rick promised. This writer can’t wait.